UA-281. Large (14.2-17.7 inches). Cuff for digital blood pressure monitors. Comfortable, easy-to-use cuff with air connector plug. 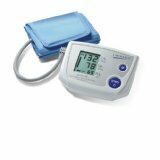 For use with LifeSource and A&D Medical digital blood pressure monitors. See chart on back to select proper size cuff. Lifetime Warranty. Made in China. Using the correct size cuff is important for an accurate reading. Measure the circumference of your upper arm at the midpoint between the shoulder and elbow. Select the proper cuff size from the chart below. Recommended Cuff Size - Small (Arm size 6.3-9.4 inch): Cuff Model No (UA-279) Medium (Arm size 9.4-14.2 inch): Cuff Model No. (UA-280). Large (Arm size 14.2-17.7 inch): Cuff Model No. (UA-281).